Emergency Fund Earthquake 2015 for TOIT and KOPILA - SAHAYA Nepal e.V. Webseite! A strong earthquake devastated on April 25th the cities in the Kathmandu valley, the most populated area of Nepal, including Bhaktapur: many ancient temples and a significant part of all houses collapsed by the shaking ground and can not be used anymore. Many people stay on open ground day and night, with a piece of foil as shelter. Aftershocks continue since many days. Shelter, clean water and food are getting rare. Many like to help, but are looking for the best approach to do so. In the initial phase the big NGOs are probably best situated to provide the basics and know-how to as many people as possible. In most case they are reliable and effective. 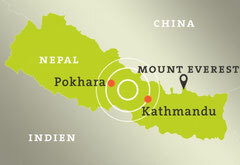 What we can and will do is to complement this initial help by what we can best: raising donations for an emergency fond for our main partners in Nepal TOIT and KOPILA, to deliver the fund fast, directly and complete. Our Infrastruktur is in use since some years and has been optimized: our association, bank account, partner, processes: this is now a valuable resource. We were seeking financial support for repairs, food and all things which are necessary to survive. And the project collected € 12.000.- by your support: THANK YOU SO MUCH !